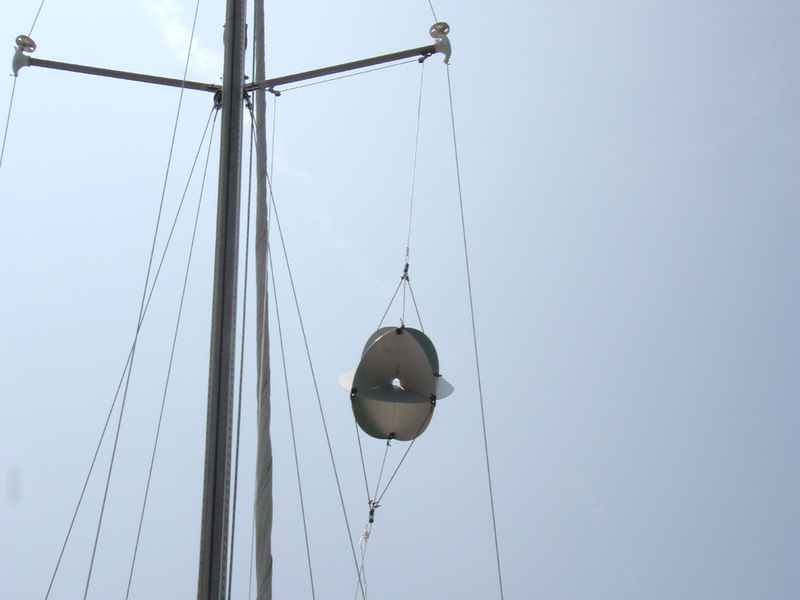 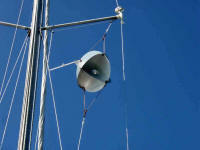 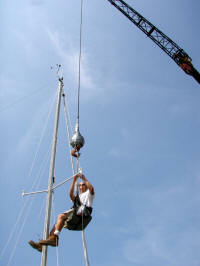 The new radar reflector hoisted smartly on its halyard. Back on the mooring, I finished rigging the throwable lifering on its mounting bracket, attaching 60 feet of polypropylene floatable line to it, clipped on by a carabineer for quick release. 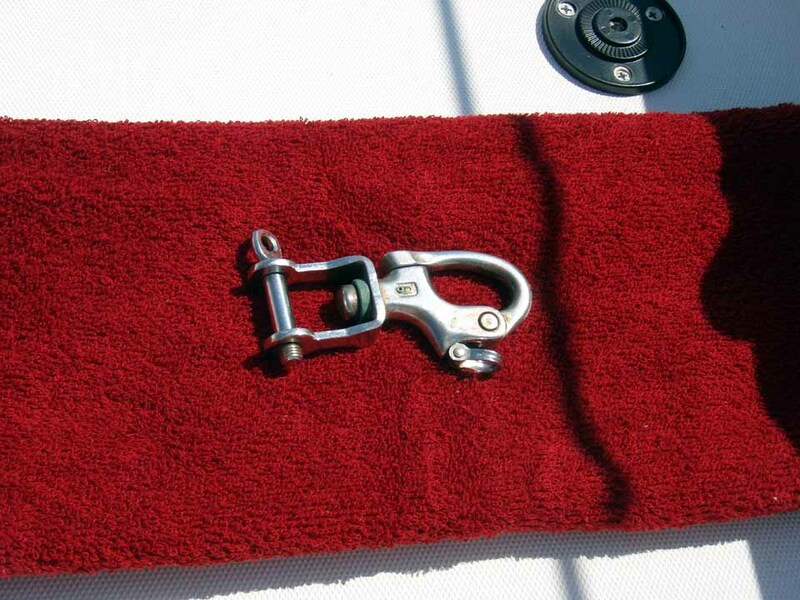 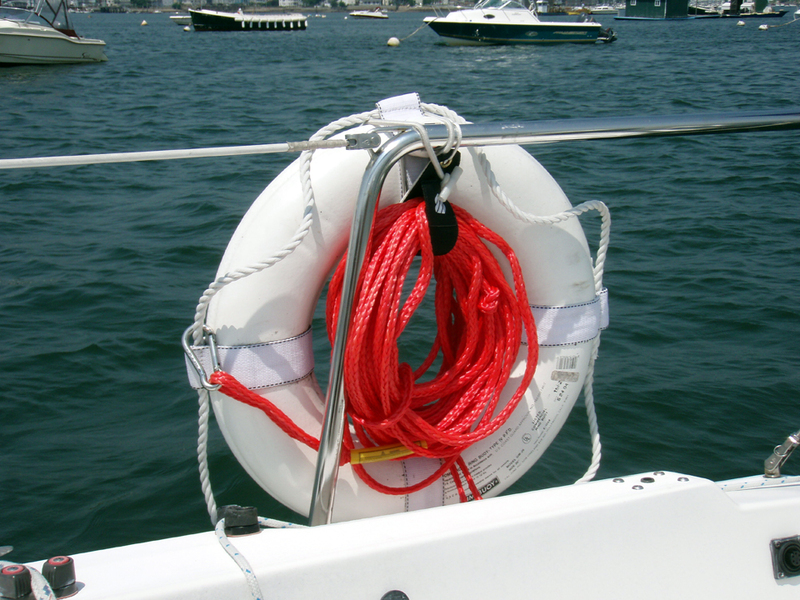 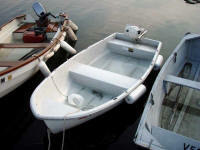 The line is dual-purpose: It will double as a grab-line dragged behind the boat in rough weather while singlehanding. 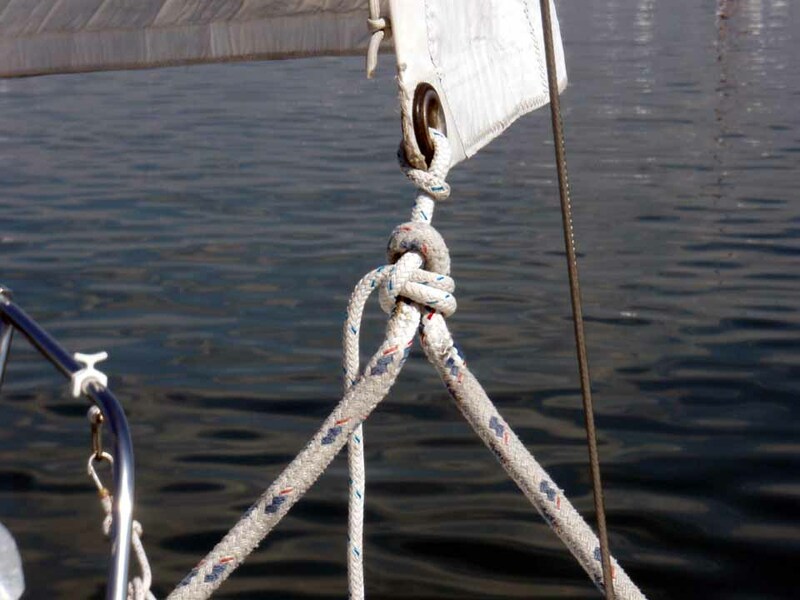 While out sailing on Saturday -- or trying to in near-doldrums -- The flogging genoa's shackle kept hanging up on the shrouds; the light to non-existent and variable air was of little assistance when slowly tacking. 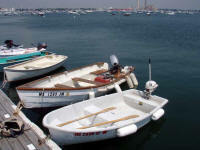 It was time to do something about this longtime annoyance, and there had been lots of advice in previous days among members of the C22 discussion group. 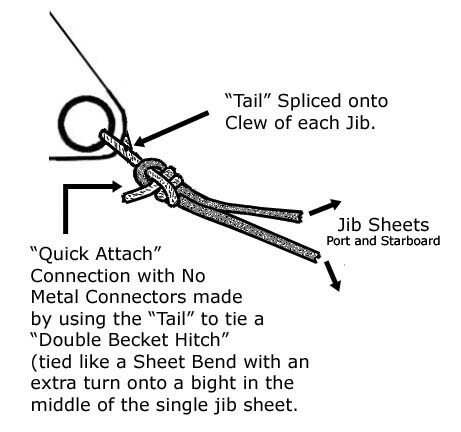 Lan Yarbrough ("Monkey Shines"), a member of the discussion group, sent along a drawing of a "double becket hitch," which I thought would work nicely. 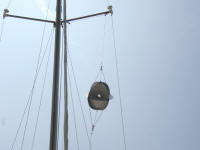 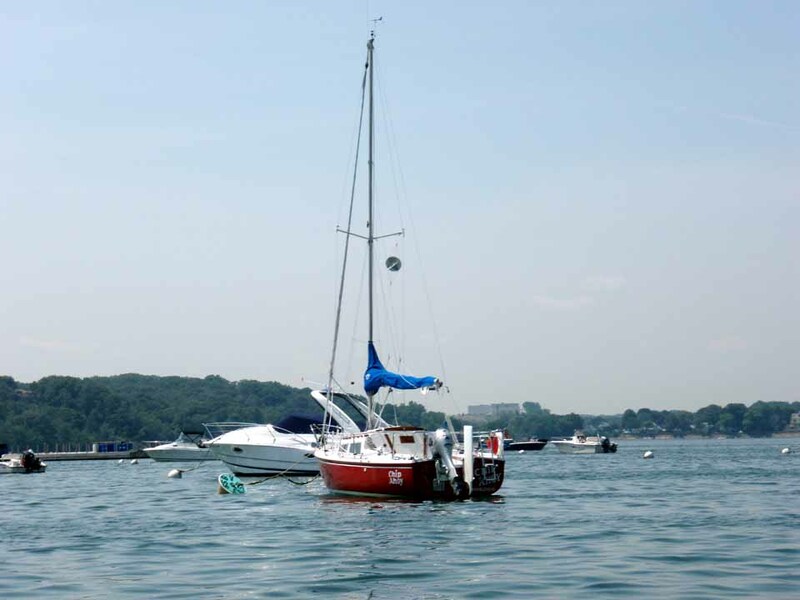 I removed the heavy shackle from the jibsheet and tied the sheet to the genoa's clew with a short length of line temporarily until I could return to the boat and apply the correct knot. 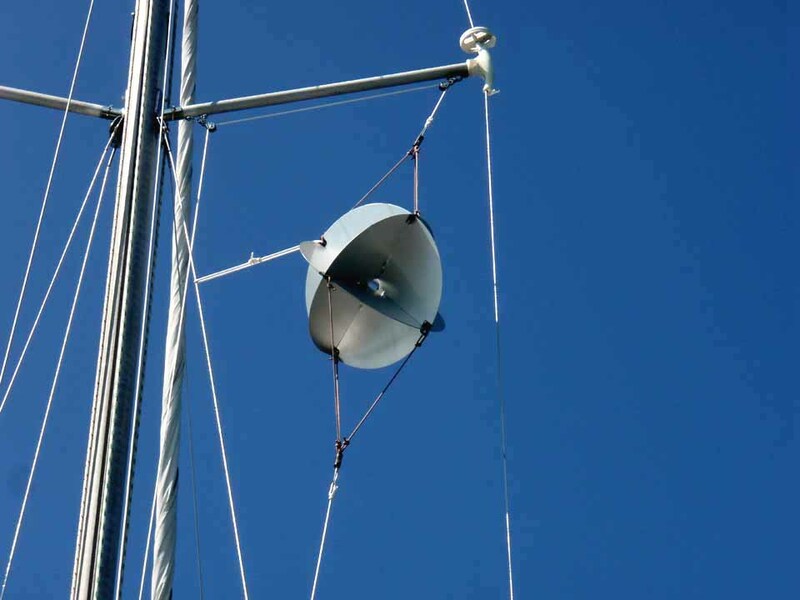 When that quick improvement was completed, I added a loop to the radar reflector and around aft-lower shroud to keep it from spinning in strong wind, potentially fraying its halyard, as recommended by the manufacturer in its instructions. 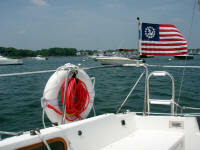 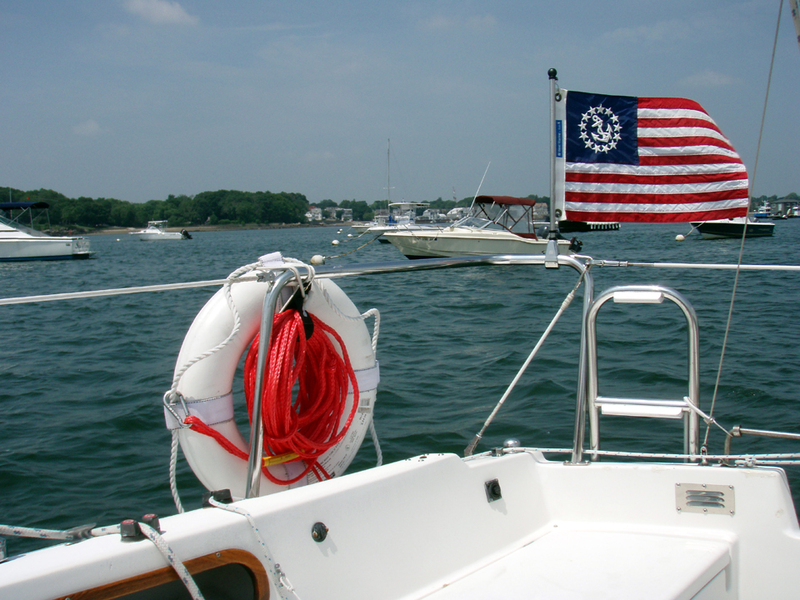 I'm almost ready for my Monday departure for Chebeague Island in Casco Bay, Maine! 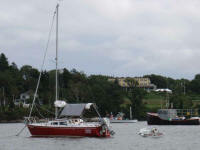 Chip Ahoy on its mooring, the photo taken from Chip Mate. 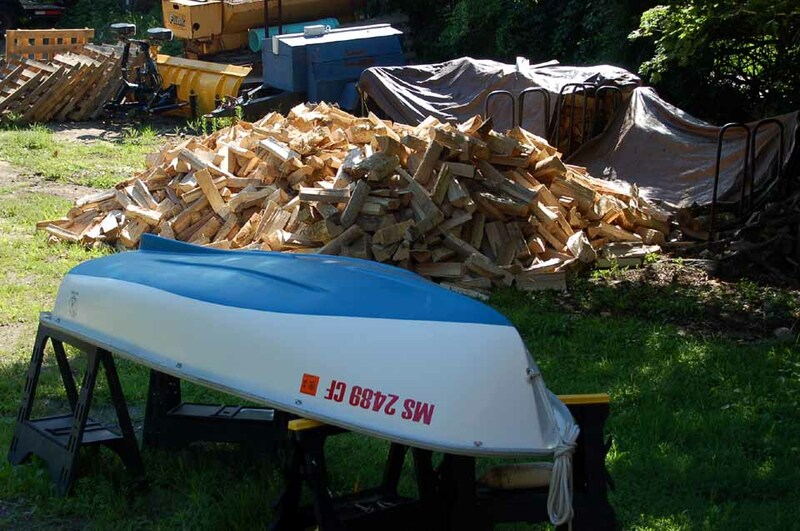 But for the final big loading -- for which I'll bring the boat to the dock late Sunday -- it's ready to go. 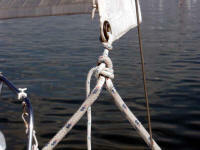 I wish I could say the same for me, but I'm still wondering, "What am I forgetting to bring or do?" 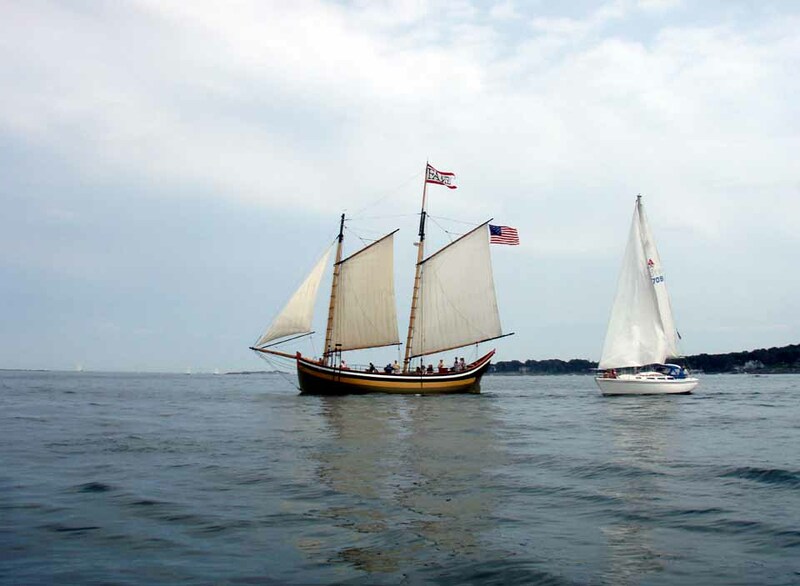 Chip Ahoy and I left Marblehead on July 25 and arrived at our mooring off Chebeague Island, Maine (photo on left) in Casco Bay on August 2. 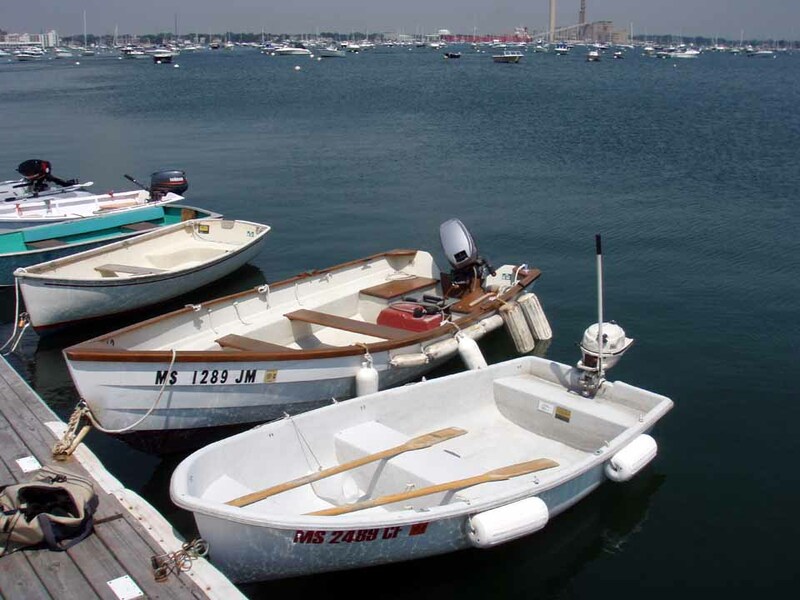 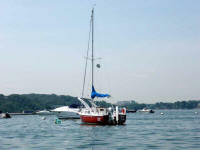 We made it back to Marblehead on August 13. 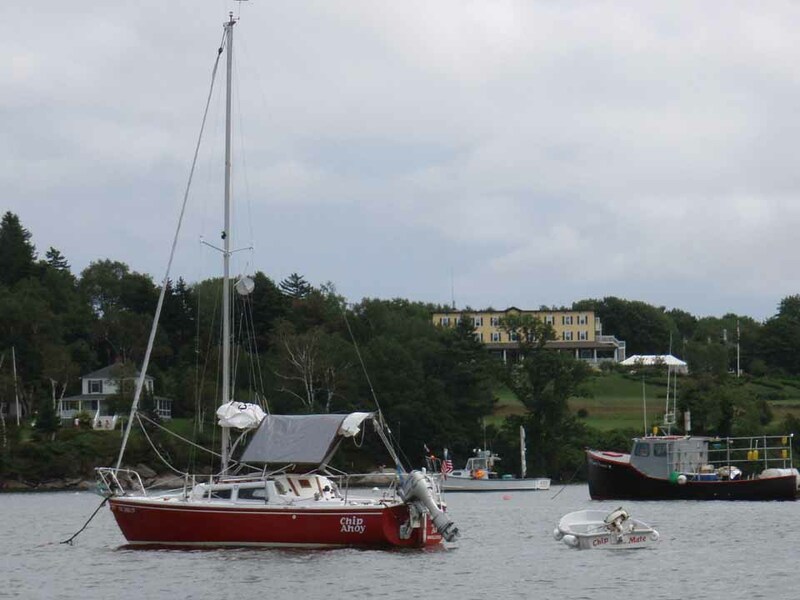 The planned two-week "seafaring" cruise took 19 days round-trip and covered 250 nautical miles (287 statute miles) in overall miserable weather conditions.